Immediately after the Blue Have Hotel, there is a break in the white fencing. 125 steps down from here lies this gorgeous little bay surrounded by palms, almond and flamboyant trees. The sand is brown, the sea shallow until a good way out. The breakers are far out and mostly quite small but good for body boarding, with the very occasional big one. Good for young children as the sea is reminiscent of the South Coast of England (apart from the temperature) with its almost flat sands and long ripples of the dying waves. There is also a children's play area with swings and a slide. The sun loungers belong to the hotel and are free for hotel guests but you can rent them for $50tt for the day and you also get the use of their facilities – toilets and shower. A small bar with limited menu run by the hotel overlooks the beach, but it is NOT cheap! It is usually busy on Sundays with locals playing football here. You could also pop up to the hotel, have a cocktail and use their pool. 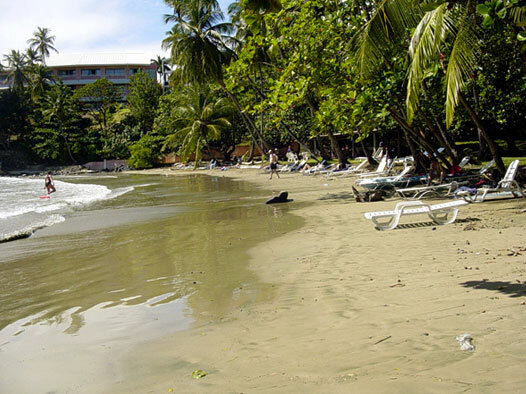 This beach is only a 15-minute drive to from Mary's Hill Lodge.